The van life movement has exploded over the past few years. 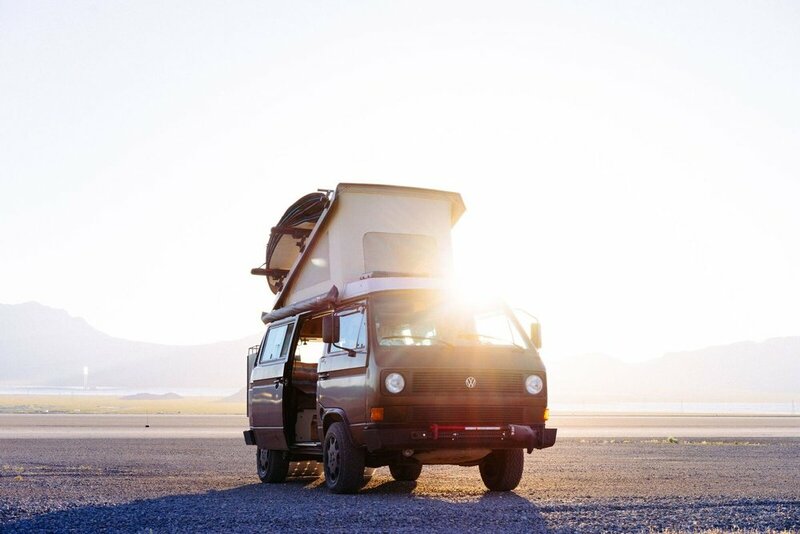 Every other Instagram post on any adventure channel features a picture of a campervan parked in some epic location, its drivers holding a cup of coffee as the sun begins to rise. Questions begin to roll through our heads: How do they afford to travel? Why did they choose that van over others? How did they construct the inside? How did they get started? To get some answers, we talked to four amazing couples and asked them about their experiences: the challenges they face, their favorite memories, and a few tips and takeaways for those who may be interested in joining the #vanlifemovement! Katie and Evan had spent most of their weekends camping and going on road trips long before they even thought about converting a van into a home. After Evan told Katie he was wanting to try full-time van life, the Portland natives began planning this exciting new chapter together. In October of 2016, they bought their 2016 144’ WB Mercedes Sprinter High Roof. After around six months of building the inside to their liking, the couple moved into the van full-time in June of 2017. Over the next year, they explored all 50 U.S. states and parts of Canada. 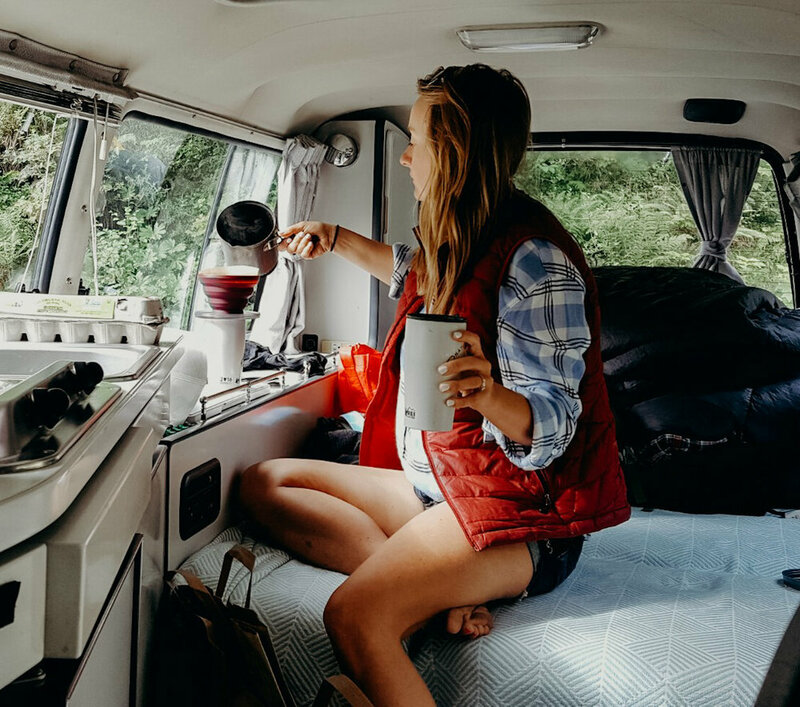 Originally, Evan and Katie had saved enough money to travel in the van for around a year, but in January, Katie landed two remote jobs - the Editor-In-Chief of Go-Van and the Social Media Specialist for Travel Her Way - making the idea of van life for the indefinite future a possibility. Evan was able to find seasonal work in Oregon. Currently, the couple is recharging in their home state and plan to hit the road again in the fall. "I have never felt so in control of my own life!" “It’s hard to pinpoint one thing that is overwhelmingly challenging about van life. Overall, it’s the best way of living I’ve ever experienced. Even the ‘hardest’ or ‘most challenging’ aspects of this lifestyle are really just annoying at their worst. The challenges show up in various small ways, instead of combining into one giant hurtle to overcome. "Even the ‘hardest’ or ‘most challenging’ aspects of this lifestyle are really just annoying at their worst." “My biggest piece of advice is if something, like van life, is interesting you, figure out why it’s intriguing to you and how you can make it happen. Living in a van or traveling full-time looks different for everybody. Your journey is going to depend on why you’re doing it and what you’re looking to get out of it. I’ve met people on the road that are more interested in settling down at a campsite for two to three weeks, while others have a bucket-list they’re trying to complete and never stop moving. It’s also going to affect what kind of adventure rig is right for you. There are some vans with no electricity and just a cooler. There are some vans that have functioning bathrooms with hot water. 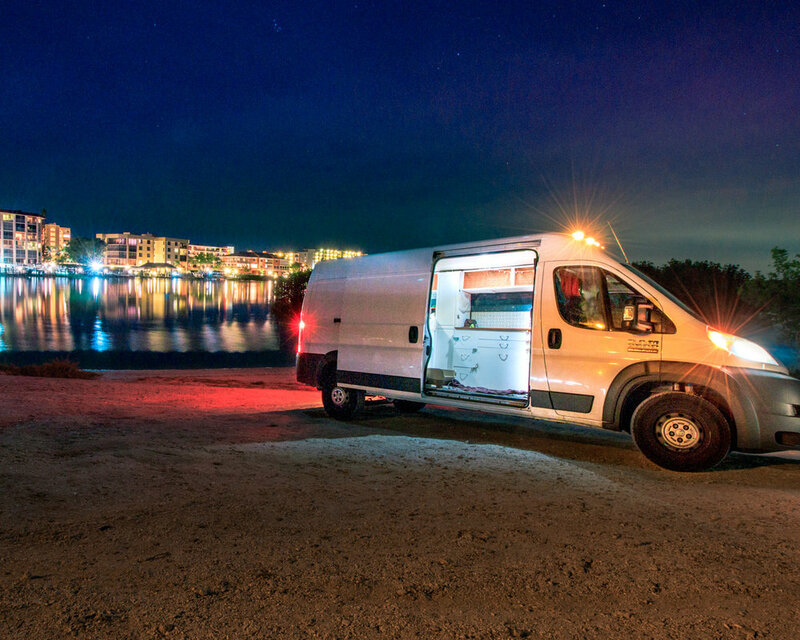 Knowing your reasoning behind this endeavor is really going to help you make the thousands of small decisions that are involved with buying a van, converting it, and moving into it. Also, "vanlife" looks like one thing on the outside and people have a very different opinion than those of us who are living the lifestyle on a daily basis. Before I moved into my van last summer I expected every campsite to be breathtaking, every moment to be full of bliss, and to generally live a stress-free life on the road. While these things might be true some, if not most, of the time, it’s definitely not like that every day. Life on the road is still life. There are still things that need to be done in order for my life to be functional. Mak and Owen met at Savannah College of Art and Design in 2008 while on the swim team together. Mak was born into a military family so she grew up traveling: at a young age she had already lived in Germany, Hawai’i, Georgia, Kansas, Washington D.C. and New York. Her parents lived by the notion that every place had something amazing to offer, so every weekend they were out hiking, camping, or exploring a new city. Owen’s love for travel started with his love for Mak: after she graduated they went on a road trip, and that was that. 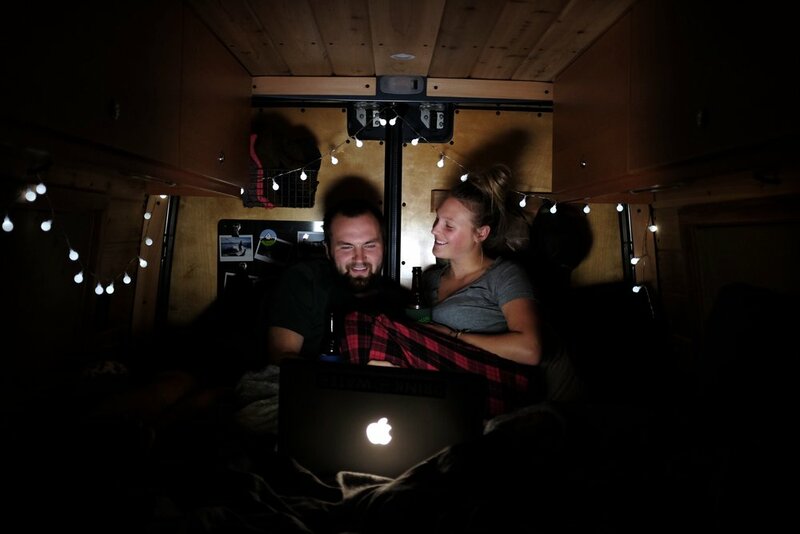 The couple works remotely from their van so they can draw inspiration for their work. Mak works as an Illustrator and Graphic Designer and Owen works as a Motion Graphics artist. The couple spends their weekdays in cell phone range, talking with clients and working from their van. On the weekends, they venture out into the wild. The pair plans to explore more of the U.S. and Canada over the next year or two, then travel down the Pan American Highway into Central and South America. Once they’ve seen all that they can see, they dream of then shipping their rig to Europe and continuing their life on the road overseas. 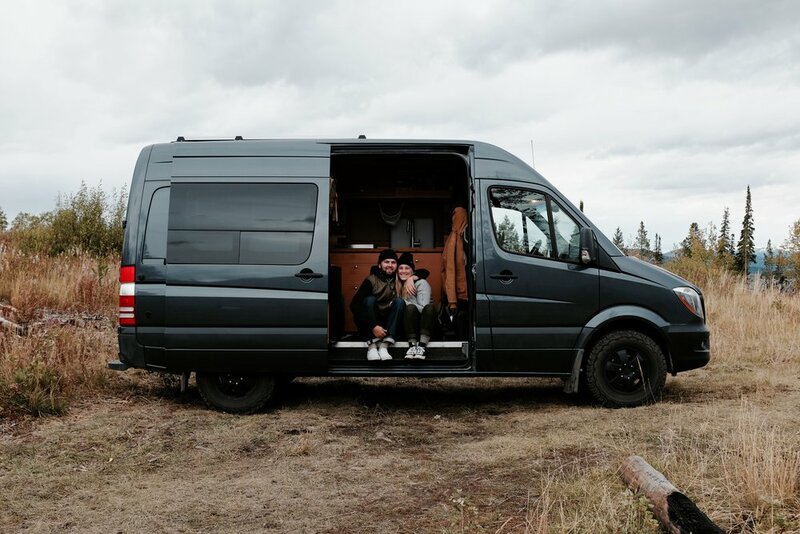 "You do not have to have an overpriced, overly decorated sprinter van to live or travel." The Parks WILD Tank - Click to Shop! “So many people reach out to us and ask how they can get into van life and a lot of people feel held back by what kind of vehicle they have access to/can afford. I want to make it clear that if you have a little sedan that's perfect, if you have a pickup truck that’s perfect too! You do not have to have an overpriced, overly decorated sprinter van to live or travel. As long as you have a vehicle you can trust there is a way to make it work on the road! It more important that you are out there enjoying the world then what vehicle you are doing it in. 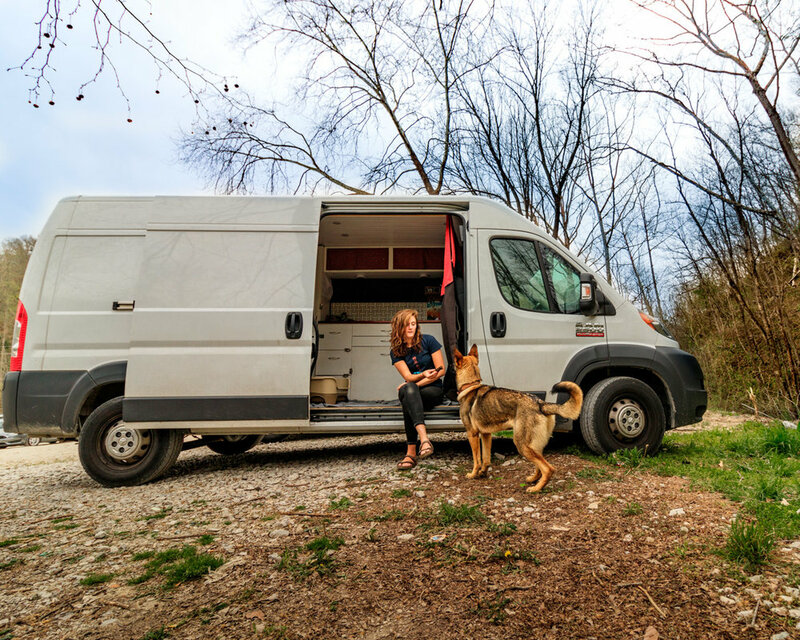 The dream of living full-time in a van began at different times for Emily and Griffin. Obsessed with rock climbing, Griffin watched climbers travel all over the world to beautiful places to climb and wanted to feel that freedom and sense of exploration. The night Emily and Griffin met, she casually told him how she wanted to live in a bus and travel the world: It was love at first sentence. They soon got married and began looking for a van to convert into their home on wheels. After not being able to find any great remote jobs, the couple then decided to apply for part-time jobs at whatever location they were at. Though this wasn’t their original plan, it turned out to be one of the best decisions they made. They have found that it makes them stay longer in a certain area, allowing them time to explore and get to know the people in the community. The pair has worked at beach clubs, climbing gyms, and coffee shops all over the U.S. Along for the ride is their German Shepherd, Luna, who is a total handful but also a total sweetheart. Griffin and Emily cannot imagine doing this without her and love seeing her play outside all day every day. "There are always a million excuses for not chasing after a dream, and if you let yourself believe any of those excuses then you will regret that for the rest of your life." “We fully expected to miss a lot of things we were giving up when moving into a tiny space, like a mirror, oven, toilet, shower, personal space, and so many other simple things. After a very short time living in the van full time, we realized that we didn’t really miss these things at all. Now we see ourselves as lucky for not having all of these little things that we have to worry about. We feel like the people that hear about van life see it as either this impossible lifestyle that they could never do because of the small space, lack of meaningless possessions, or the overall change of pace that most of our society has become accustomed to…OR they see it as this glamorous lifestyle where everyone is constantly in beautiful places, eating gourmet meals, have no responsibilities or worries, and live with complete freedom. What people need to know about van life is that ANYONE can do it. Taking the first step and buying a van is the hardest part, but after that you will be so surprised at how “doable” van life really is. 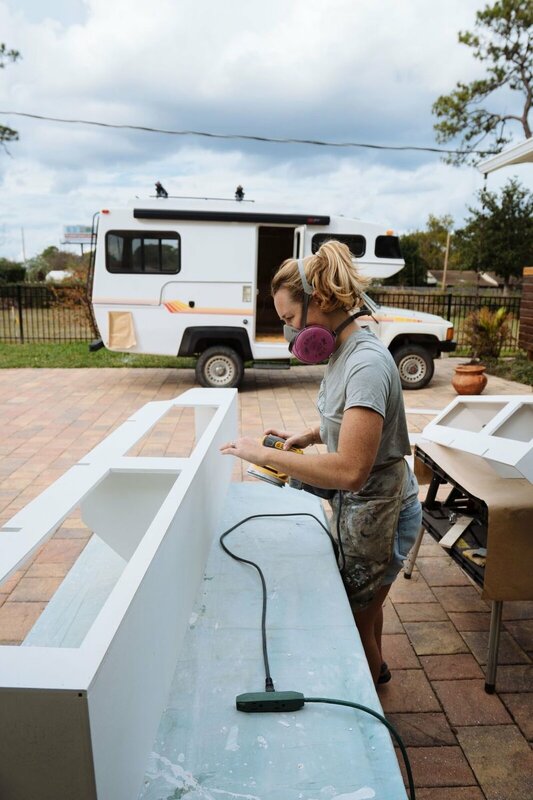 "Taking the first step and buying a van is the hardest part, but after that you will be so surprised at how “doable” van life really is." People also need to know that van life is hardly glamorous. Finding spots to sleep (a lot of the times in parking lots), working while on the road to support your travels and pay the bills, and peeing in jugs are just a few things that people don’t always see when searching #vanlife on Instagram. Our advice for anyone interested in van life is this… GO FOR IT! There are always a million excuses for not chasing after a dream, and if you let yourself believe any of those excuses then you will regret that for the rest of your life. After looking for six months for a 4x4 van that fit their needs, Kassidy and Erin finally came across a van in Vancouver B.C. that checked all of their boxes. A few weeks later they were able to make the purchase, but ended up having to cross the U.S./Canada border four times in 24 hours since they didn’t have any vehicle registration in the states yet. The border patrol wasn’t very happy, but Erin and Kassidy were so stoked to begin their new journey with Mochi. Erin and Kassidy are transplants to the Seattle area and after numerous two-week long ski trips in their van, they decided they wanted more: more time to adventure and more time to spend with family across the U.S. They saved up enough money to take a year off and this month have begun their life full-time on the road. "What we own doesn't define who we are, it is the relationships that we've built that are the representation of our lives." “We would say if you have any interest or desire to live and travel in a van, just do it. Make that decision if it’s what makes you happy and go for it. You don't need much, and things are easier on the road than they may seem. You will always find a way to make it work. Goal setting is the most powerful tool you can use to transform your dreams into reality. Period. Whatever your goal may be, write it down, discuss it with friends and family, and then see how you can adjust your daily life to support that goal. We had discussed the possibility of living full-time in Mochi, but we just decided that if we didn't set it as a goal with an actual date we would be talking about it forever and never actually do it. So, about a year ago, we set the date of July 1st on our calendars and decided that every decision we made needed to be in support of the goal of leaving on July 1st. All of a sudden, it became easier to save money. Every decision we made had a background narrative of, ‘Does this support our goal?’ It made all the difference in our mindset and the eventual outcome. "For those just starting out, start taking some longer trips to see how possible it is to live on the road for an extended period of time." For those just starting out, start taking some longer trips to see how possible it is to live on the road for an extended period of time. We went from weekend warrior trips to two-week long skitrips in the van that were so incredible and showed us how possible it was to live on the road for an extended period of time. We knew we wanted to do this full time when we came back from those trips and still wanted to be on the road and wanted to go farther. 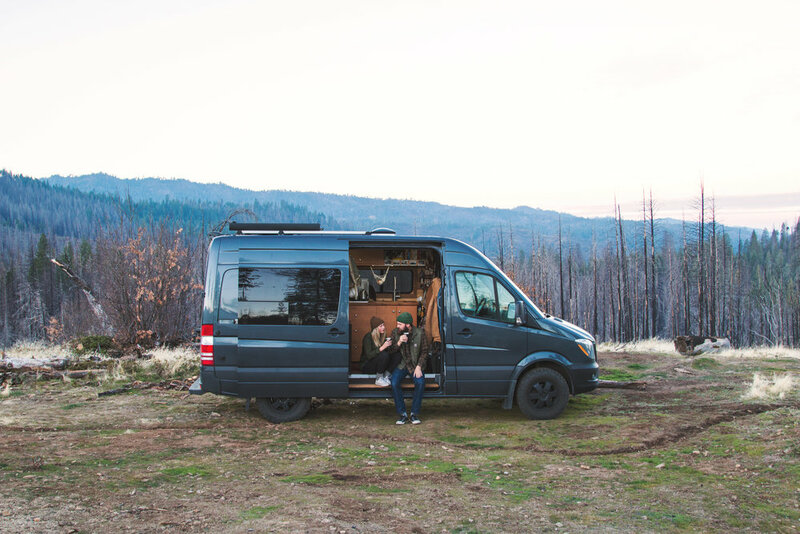 Though each couple had their own journey to getting full-time on the road, they all shared two similar ideas: the van life community is thriving, and to just go for it. Many of these people didn’t even know such a strong van life community existed when they began to put the pieces together to move into their van full-time, but have come to meet some amazing people on the road. So, are you packing your bag, getting rid of anything you don’t need, and looking on craigslist for a campervan yet? I know I am.